"Do you think its too much?" "I think it's what you want." This exchange between Nick Carraway and Jay Gatsby really says it all about Gatsby, Australian director Baz Luhrmann's overpuffed pastry of a reboot of The Great Gatsby, F. Scott Fitzgerald's iconic work capturing the glitz and depravity of the roaring 20s. It is not so much the film the audience wants to see, but the film that Luhrmann wants to see. The first 45 minutes of the film are basically Moulin Rouge: Gatsby Edition, (referring to Baz Luhrmann's 2001 feature) with jittery camera work and way, WAY too much going on, all gauze and diamonds and confetti cluttering up the scenery. 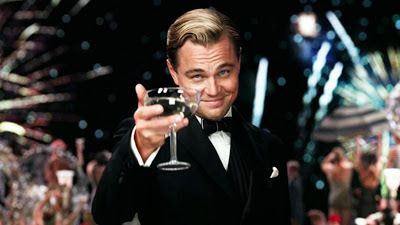 It is not until Gatsby comes onto the scene, with Leonardo DiCaprio "old sporting" it up every chance he gets, that the glittery scrim that obscures much of the first part of the film gets pulled aside and the audience gets a chance to see into the heart of the story. There's no denying it is a rich visual spectacle, but one that I enjoyed more when the cameramen decided to cut back on the caffeine. But there are lovely moments, such as when my favorite quote from the book “In his blue gardens men and girls came and went like moths among the whisperings and the champagne and the stars" appears across the screen as we see Nick, played by the eternally fresh-faced Tobey Maguire, typing the words diligently into his typewriter (a la Ewan McGregor in Moulin Rouge). The words flit across the screen in a pale blue color to flit away and disappear. It's those tiny, singular inspired moments that makes the film worth seeing, but not enough to make it truly shine. In the words of Gatsby: "Nice try, old sport."